We pay cash for used autos (ANY CONDITION) - even if it's not running! That's right! We come to you, and take away your problem and pay you to do it! We want your auto! Give us a call, and we will pay you cash ON THE SPOT for your used car, even if your car is not running. Plus, we tow autos for free! 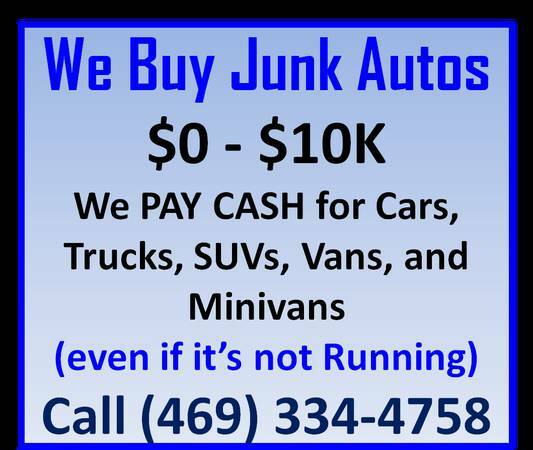 We buy all sorts of vehicles: cars, trucks, SUVs, vans, minivans, pickup trucks... and you'll get paid, no matter what: junk car removal/junk cars. Want cash for your clunker? Want to get paid right away? Give us a call today. Let us put some money in your pocket and make things easier for you.